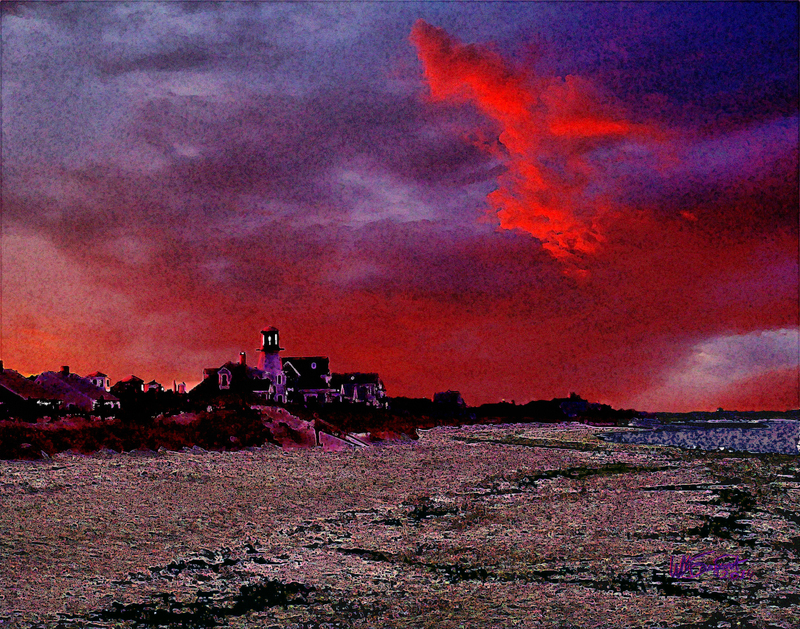 Its early rays made impossibly red by the smoke of distant forest fires in the west and volcanic dust in the atmosphere from Icelandic eruptions to the east, the sun prepares to rise over a Cape Cod beach. 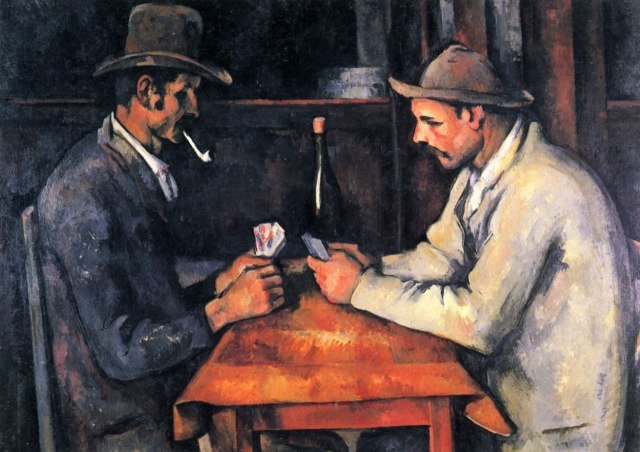 In 2011 The Card Players, a painting by Paul Cezanne, was sold by a private collector to the state of Qatar for $250 million. It was one in a series of at least five paintings Cezanne did of card players. It commanded one of the highest prices ever paid for a painting. 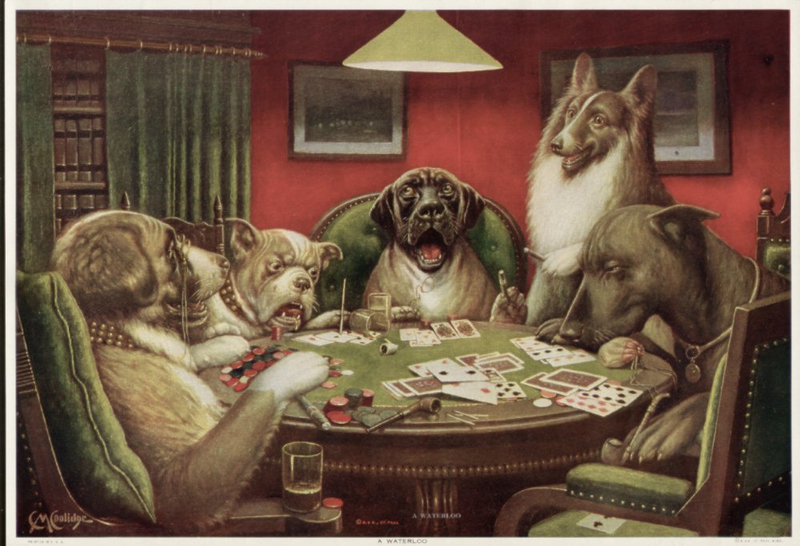 Here are three different paintings of card games with three very different prices. One can be traced back in unbroken line to the artist who produced it, a genius at the peak of his powers. One is dismissed as commercial art or illustration rather than fine art, yet still sells for a premium at auction. One is sharply discounted because, though it may be the work of a Renaissance master, might also be a clever fake. What determines the price of a work of art? Why is the work of an unknown artist worth so much less than that of a recognized master, even if its genius is such that even experts cannot be sure it is not that master’s work? Why is artwork meant to illustrate a narrative or incorporate a commercial objective less valuable than art for art sake? In a recent essay in The Brooklyn Rail, art critic and historian Alexander Nagel points to an interesting dichotomy in the way we value art. On the one hand we look at an artwork for its visual or intellectual appeal. Unless we have formal training in the fine arts, we tend to conceal this aspect of our art appreciation, or to reveal it only apologetically: “I don’t know much about art,” I say, “But I know what I like.” Viewed purely in this way, a copy is as good as an original. In fact, there is really no such thing as a copy. All paintings and sculptures are original, even when they faithfully reproduce another work. Forgery is not possible, only homage, and there is no need to conceal or falsify authorship of a work. Alternatively, art can be viewed as a relic. According to Nagel, “art becomes a relic when what matters is this physical object’s provenance: who made it and at what time.” An ancient cassock is an artifact, valued as an antique. A cassock worn by Saint Francis is a relic, and therefore vastly more valuable. If it can be proved that it has no connection to Saint Francis then it is a forgery, and it reverts to its value as an antique (augmented a bit, perhaps, by its notoriety as a fraud if that can be proved). “These rules apply in any relic cult, whether it is focused on Buddha or Elvis,” says Nagel. Of course, it is not necessary to see an artwork exclusively as a visual experience or a relic. We see each artwork in both ways simultaneously, though one or the other is dominant. Up until the Renaissance, the image was king and the relic aspect of art carried little weight. When Michelangelo was commissioned by a Medici to sculpt a sleeping cupid that looked ancient, he used techniques that today would be associated with forgery, such as stressing it and burying it for a while in acidic soil to simulate a patina of age. He was so successful that the Medici was able to sell the piece as an antiquity for 200 ducats, though he had paid Michelangelo only 30 ducats for it. There was fraud here, yes, but it was perpetrated by the Medici merchant, from whom such practices were expected, and not by Michelangelo, the artist, from whom they were not. Far from branding him a forger, Michelangelo’s techniques were considered a part of his art. His skill as a sculptor so impressed the buyer, Cardinal Raffaele Riario, that he commissioned the Bacchus, one of the two sculptures, along with the better known Pieta, to survive from Michelangelo’s first stay in Rome. (Unfortunately, the Sleeping Cupid did not.) The wealthy woman who eventually obtained the faux antiquity was so taken with its artfulness that she displayed it prominently alongside a real ancient sculpture, a Roman copy of a work by the great Greek sculptor Praxiteles, to highlight its maker’s skill; she went on to be a faithful patron of the artist. 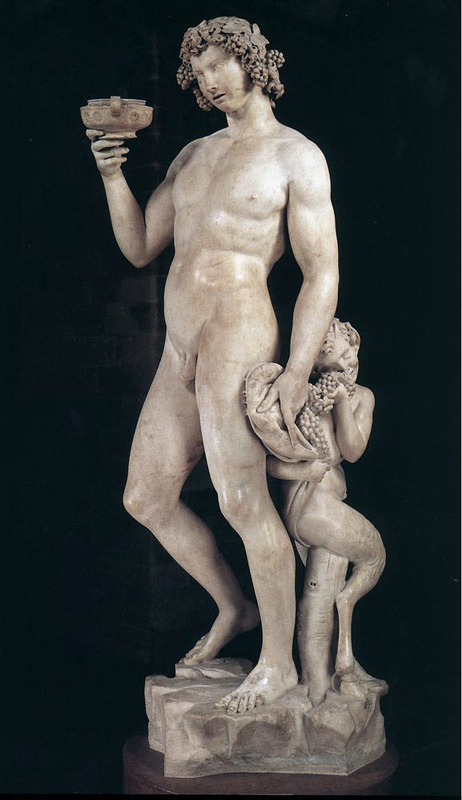 In the end the affair cemented Michelangelo’s reputation as a sculptor. After the Renaissance things began to change. The great masters had solidified their reputations, and their apprentices and students had a vested interest in keeping their masters’ techniques alive. The importance of an artist’s work gradually became less dependent on its visual impact, more dependent on who he was, which in turn was dependent on where he learned his art. The governance of art in Europe coalesced around the École des Beaux-Arts, founded in Paris in 1648, and its exhibition venue, the Salon, which opened in 1725. At first this reign was near absolute and oppressive. If you were accepted by the Salon you were an artist, and your work earned high commissions. If not you were amateur, and you needed a day job. Toward the end of the nineteenth century the iron heel of the Salon began to slip. At independent exhibitions like the Salon des Refusés in Paris, first held in 1863, and the Armory Show in New York in 1913 New York, the world was introduced to Impressionism, Cubism, and the whole burgeoning phenomenon, beginning to thrive outside the hegemony of the Salon, that has today become the diverse world of modern art. Throughout all this chaos, the the organized art world became ever more deeply committed to the cult of the relic, and it remains so to this day. In such a world, the value of artworks with a strong pedigree and uninterrupted chain of provenance can be astronomical simply because of their rarity and irreplaceability, as the quarter of a billion dollar price tag on the Cezanne illustrates. 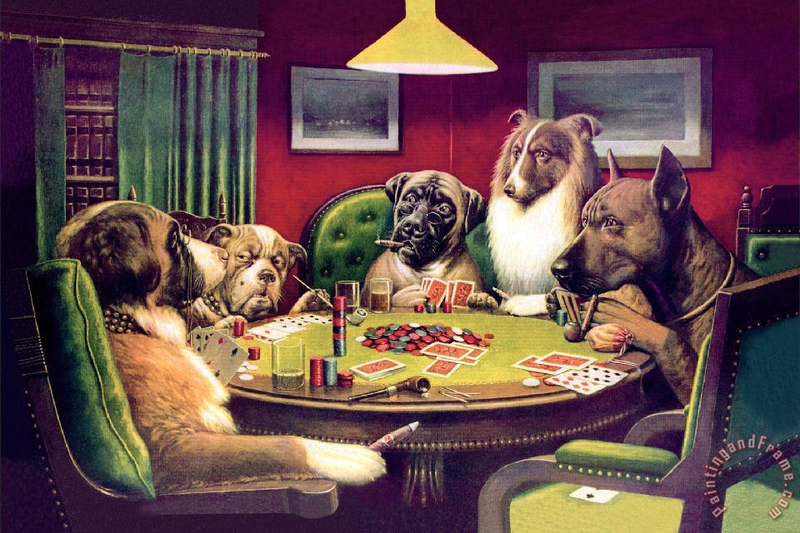 Even works of less ambitious artistic intent can command significant prices, like the half-million dollars for the picture of dogs playing poker. 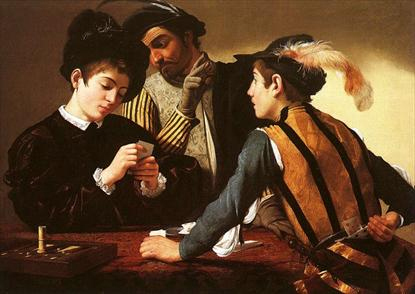 Questionable pedigree or sketchy provenance is the kiss of death; The Cardsharps is indistinguishable in materials and technique from the work of Caravaggio, a recognized Renaissance master, yet it is valued at only a small fraction of an ad for cigars.